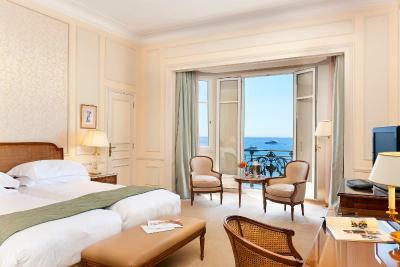 Lock in a great price for InterContinental Carlton Cannes – rated 8.5 by recent guests! The front desk and concierge were fantastic. Should be a case study on how to treat guests. The rooms were a good size. Breakfast was excellent. When we checked in, they upgrades us to a suite. But I immediately noticed that the WC was separate from the main bathroom and the WC was tiny. The door was right in front of one's face. I asked if they could move us rooms and they immediately accommodated us. The beach is wonderful out in front. Breakfast is excellent! Service is generally very good. Staff is friendly. The Carlton is an institution in Cannes. An amazing building that sits in the Middle of the strip facing the beach. It’s all class. A wonderful experience. The best of all for us was the concierge. Gave us some great tips for travel and were really helpful. Also the beach was great. The great hotel, great location, great staff. I will be back with great pleasure. The location and the room view and luggage weighting. The service was great and the location is just perfect. One of our top picks in Cannes.Built in 1911, the InterContinental overlooks the bay on the Boulevard Croisette and features its own private beach, pier and Belle Epoque façade. 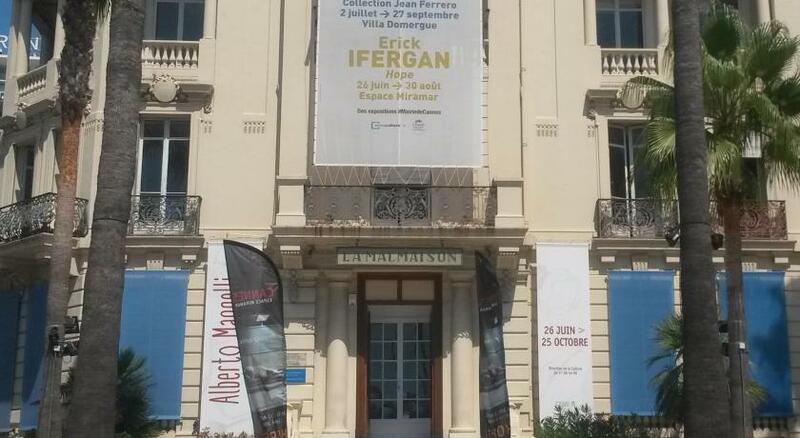 It is located 2,650 feet from the Palais des Festivals, in central Cannes. 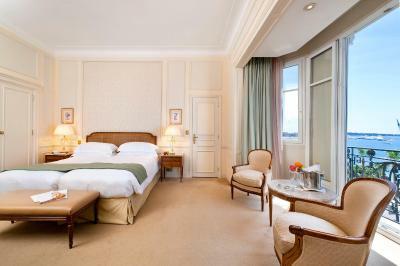 The InterContinental Carlton Cannes offers air-conditioned guest rooms with satellite TV, video games and luxury bedding. The elegant rooms overlook central Cannes or offer panoramic views of the bay, and certain rooms and suites feature a balcony. The Carlton beach restaurant is open during summer and another traditional restaurant is also available on site. Guests can also enjoy a drink at the Carlton Bar. The conciergerie is available 24 hours to assist with car rental and beauty treatments. A fully equipped Carlton Fitness Center is provided exclusively for guests' use. The InterContinental Carlton Cannes is just a 25-minute drive from Nice Côte d’Azur Airport and 5 minutes from Cannes railway station. 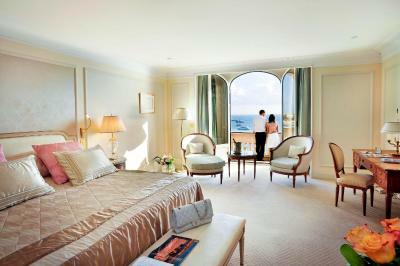 When would you like to stay at InterContinental Carlton Cannes? This room is decorated in the colors of the French Riviera. It has a mini-bar and cable TV. Private parking is available at a location nearby (reservation is needed) and costs EUR 45 per day. This room is decorated in an elegant style. It has a mini-bar and a flat-screen TV. 1 extra bed and 1 baby cot can be accommodated in this room upon request. This bright room is decorated in the Hollywood style of the 1950s. It features a panoramic view over the Bay of Cannes. Decorated in a characteristic Belle Epoque style, this suite features views of the Mediterranean sea and is composed of living room and bedroom. This room was featured in the Alfred Hitchcock film 'To Catch a Thief' and offers a panoramic view of the Mediterranean sea and elegant furniture. Each bedroom has a private bathroom. There is a place at the heart of La Croisette where you can enjoy a truly unforgettable moment in an intimate setting. Thanks to 100 years of tradition at your service, the InterContinental Carlton offers a unique experience under the sun. House Rules InterContinental Carlton Cannes takes special requests – add in the next step! InterContinental Carlton Cannes accepts these cards and reserves the right to temporarily hold an amount prior to arrival. This deposit will be refunded based on cancellation policy attached to booking in reference. The Superior rooms can accommodated 1 extra bed and 1 baby cot. The other rooms cannot accommodated an extra bed. Please note that a high-speed WiFi connection is available at the property for an extra charge. Please inform InterContinental Carlton Cannes of your expected arrival time in advance. You can use the Special Requests box when booking, or contact the property directly using the contact details in your confirmation. Nice people at the reception, perfect service !!! Everything about the Intercontinental Carlton in Cannes is absolutely wonderful which is why I keep on going back year after year - I love it. Our experience was a very positive one & that is why I have returned to stay in this hotel again.